Pictured left to right in the top row are Hazel James, Golda Wilson, Pauline Rezac, Bea Miller, Emma Trostle, Ethel James, and Joe Parr. In the second row are Claude Sneller, Elizabeth Jackson, Mildred McCollough, Doris Jamieson, Unidentified, Unidentified, Grace Sneller, Eunice Ward, Edna Burns, Thurlow Neiswender, Unidentified, Mabel Moses, and Blanche Kesler. In the third row are Ora Parr, Ed Doud, Pauline Baylis, Helen McPherson, Irene Howard, Mabel Howerton, May Seeley, Emma Stovall, Gladys Hartzell, Gladys Eversole, Lettie Page, Ludmilla Dolezilek, and Edna Sanders. In the bottom row are Howard Bixby, Earl Barney, Edwin Stamp, Unidentified, Unidentified, Unidentified, Glenn Page, Clyde Strimple, and Leslie Griswold. 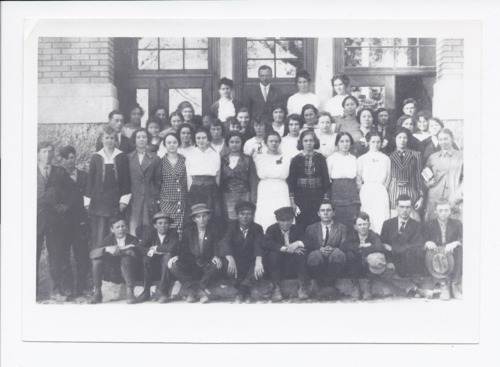 This photograph is provided through a pilot project to host unique cultural heritage materials from local libraries on Kansas Memory and was accomplished by mutual agreement between the Northeast Kansas Library System, the Rossville Community Library, and the Kansas Historical Society.